ULF DANIELSSON is thinking of buying a holiday home—or even a new house, so that he, his wife and two children can have a garden and more space than in their flat in Uppsala. He can afford either, he says, and as a professor of astrophysics is surely able to work that out. But he is hesitating, lest the giddy rise in Swedish property prices end in an ugly crash. “You risk having a big loan that’s worth more than the house,” he says. The property market has fallen a little closer to Earth: prices dropped by 9% between September and January, largely because of a surfeit of pricey new flats. They then steadied, and are around 5% below the peak—and 50% higher than at the start of 2013, calculates Valueguard, a data provider. 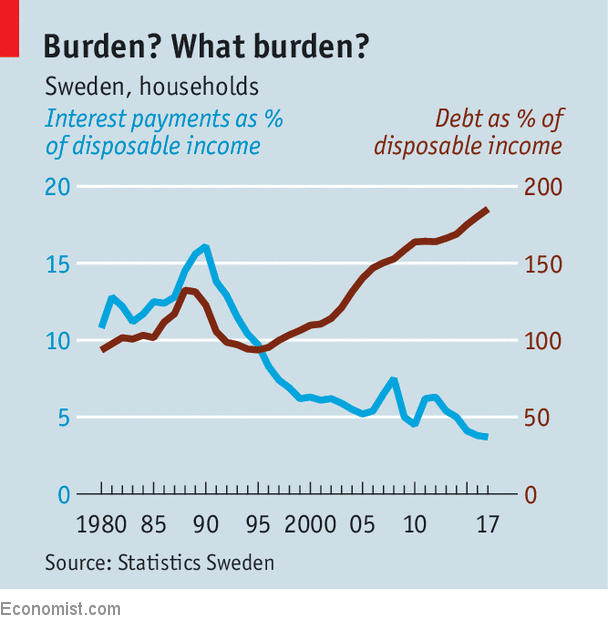 As Swedes have borrowed to buy, their debts have risen. Finansinspektionen (FI), the financial-stability supervisor, estimates that borrowers’ debts rose by 36% between 2012 and 2017, while disposable incomes went up by 13%. Almost a fifth of households with new mortgages owe more than six times net income.